What's happened to those great fall days that were so perfect for savanna and oak woodland burns? 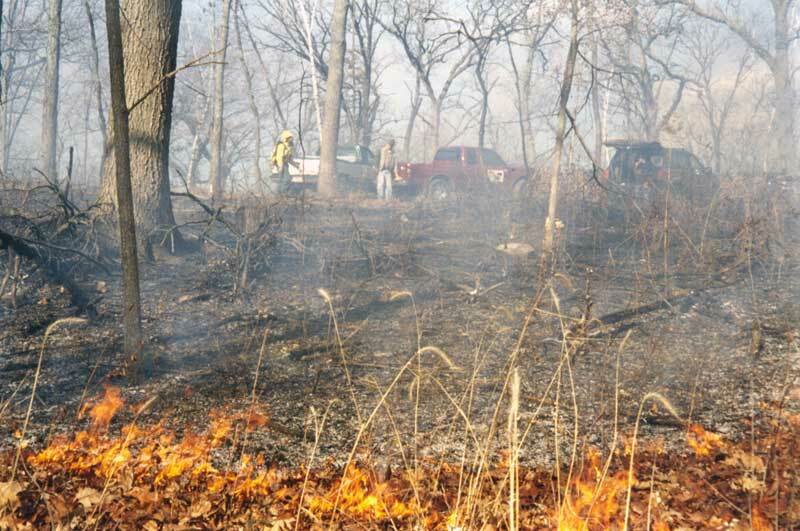 The last several years it has been difficult to find a good day for a woods or savanna burn. On November 6, 2004 the temperature at 2 PM was 75-78 F and the R.H. was 18-20% (measured by Kestrel). I question whether the Kestrel is accurate at that low R.H., but there were no clouds and the air was clear and sunny. Ideal conditions for a savanna burn. And we didn't need a permit! The map shows what we burned. The blue dashed line along the south side of the burn unit represents a new trail we call the Mid Savanna Trail. We put that in along the middle of Unit 11 savanna in order to provide access to this area. 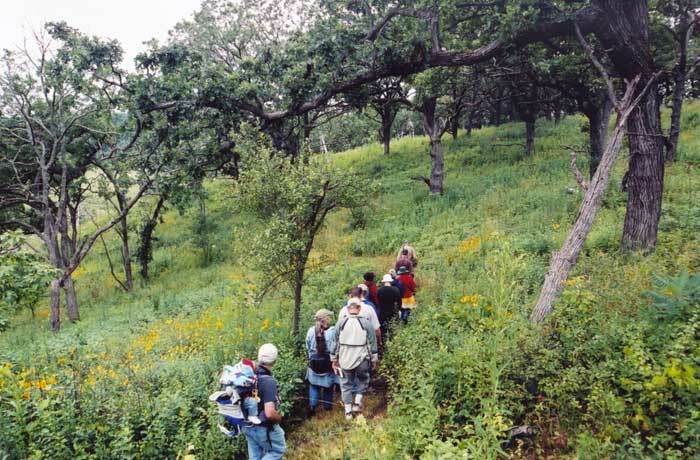 That trail ends at the East Overlook and provides a short-cut for people who want a smaller hike. According to my pencil marks, the burn coverage was very good. The few small open circles are areas that had brush patches. Not brambles, because the fire burned right through them. We had 10 people, part paid and part volunteers. We started lighting in the far east end of the burn unit. There were two burn lines, one moving south and west along the blue dotted fire break, and the other moving north and west along the north side of Unit 19 and then east along the South Fire Break. Once the whole periphery had been blackened, extensive interior lighting was done. The burn boss surveyed the area and directed drip torches to areas needing fire. We had two pumper units. 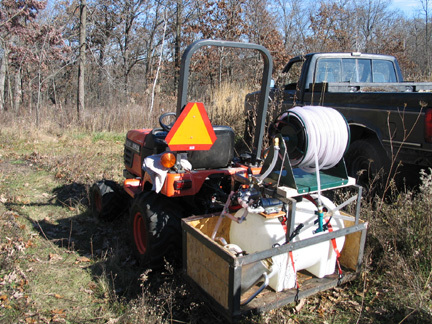 One was a high-power rig from the Prairie Enthusiasts, and the other was an electrically operated pump on the back of our Kubota tractor that Paul Michler had made. With the low humidity it was perhaps not surprising that we had a flaming tree, a large bur oak in Unit 10. We used the high-power pump to put this fire out. The Kubota rig was used to put out smokers that were too near the fire line. Using TPE's high-pressure pumper unit to extinguish the fire. An extension ladder is being used. We started lighting at 10:45 AM, and finished at 1:15 PM. Interior lighting and mop-up took until 3 PM. A great burn! Will we ever see November conditions like this again? Paul Michler made this pumper unit. The electrical pump works off the tractor battery. This whole unit was put together for less than $400. By the end of 2006 we had all the important areas cleared. 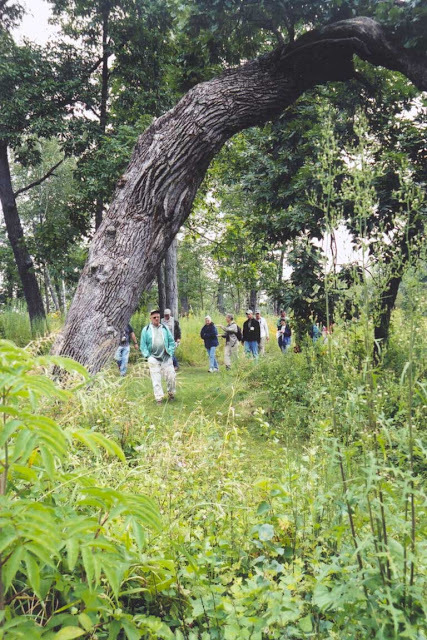 From then on, our main woody plant work was the new flush of brush and herbaceous weeds brought on by the great increase in light to the ground. 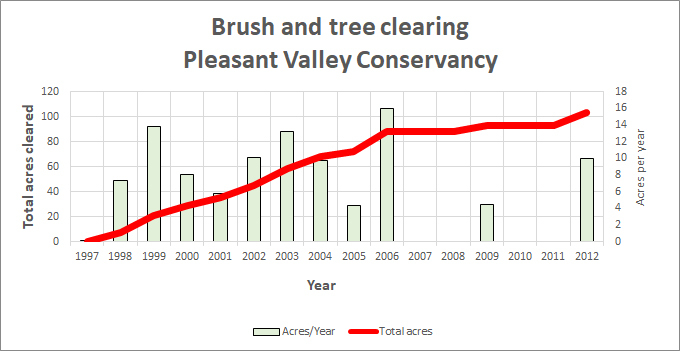 Also, once the brush and trees were clear from a unit, two other activities became major focuses: 1) controlled burns in that unit, both spring and fall; 2) seed collecting and planting. 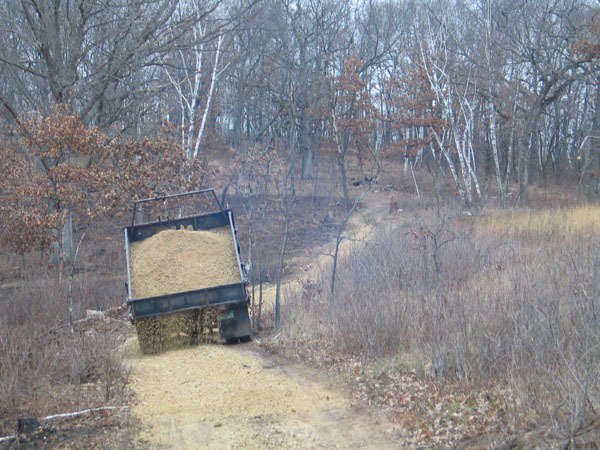 Both activities were critical to increase the diversity of the understory vegetation in the newly cleared unit. I am rather fond of the map. It gives a good view of where we worked, and when. I made it with ESRI’s ArcGIS, once I had learned how to use that software (quite a learning curve!). The areas we tackled first (1997-98) were the most visible, and provided the easiest access. Later, we moved to areas where access was not as good. Fortunately, our ridge-top road held up fairly well to half-ton pick-up trucks in winter. However, we soon realized that the road needed to be graveled, and this turned out to be worth the expense. Only when the ground was frozen hard did we allow vehicles off-road. 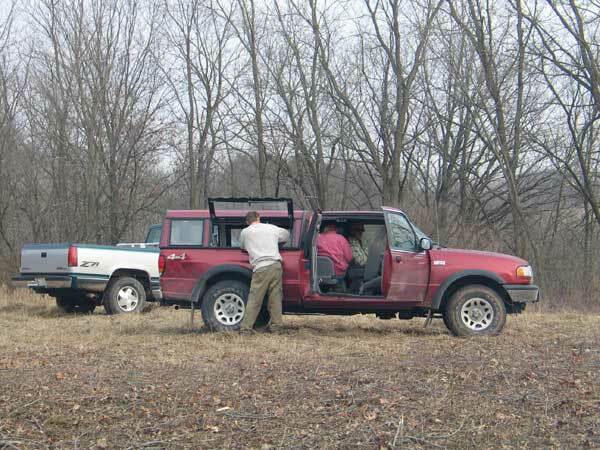 It was important to keep vehicles from ruining the delicate savanna and prairie sod. A major reason our restoration work has been so successful is that we had an outstanding restoration crew in Michler & Brown LLC. Paul Michler and Willis Brown complemented each other very well, and their other employees, especially Todd Shumate, Craig Annen, and Chris Knief, have been outstanding. During the major periods of clearing, especially from 2001 too 2005, M & B had a crew of 6, which was about optimum. My other post hasWillis' comments on how the crew worked. Another reason our work was so successful is that Kathie and I worked very closely with the crew. 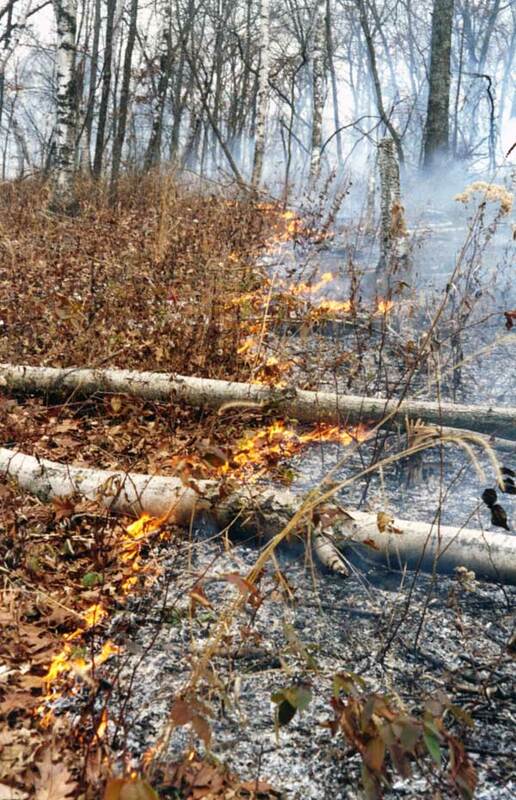 We monitored the work carefully, often helped with herbicide treatment of cut stumps, and monitored burn piles. We opened up our field station/cabin to the crew for lunch, and generally ate with them. 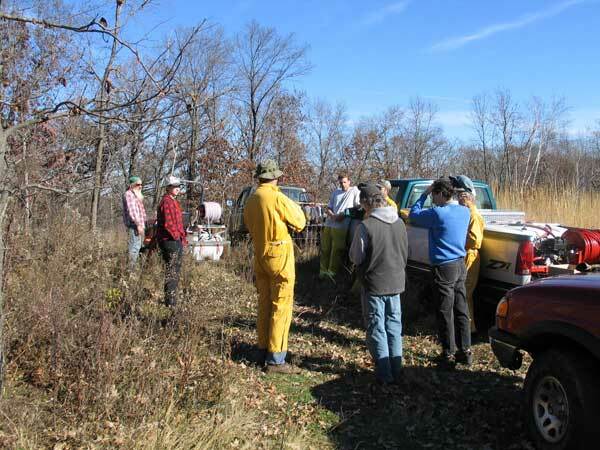 Most of the clearing crew also participated in burns, and sometimes even volunteered for seed collecting and planting. I should emphasize that PVC could have been cleared much faster, but that would have been undesirable. Once a unit is opened, it must be “tended” carefully or it will quickly become destroyed. This means controlled burns, seed collecting and planting to create a diverse understory, and continuous weed and brush control. My advice always is: if you can’t burn, don’t clear. But burns alone are not enough. Although we did not have a time schedule when we began restoration, I think our rate was just about optimal for the resources that we had available. 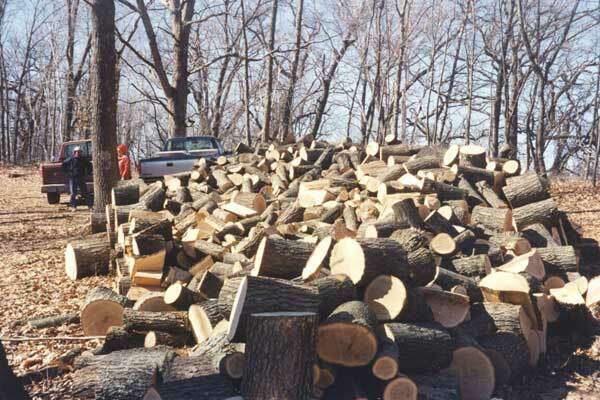 A well-built brush pile. 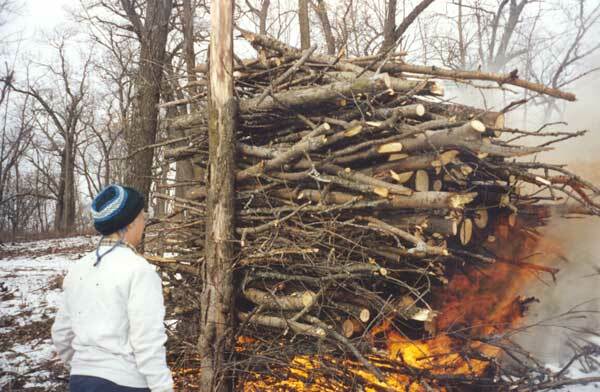 The nearby standing trees will later be cut and thrown on the fire . After the trip, Denny gave me a fat envelope full of prints, which I dutifully filed. I am now working on the restoration work done at PVC in 2004, and was delighted to find all these photos still intact. Although we thought PVC looked pretty good in 2004, I am surprised at how brushy it looks in these photos. This is the Side Road separating Unit 10 from 11A. It was a sad day when the big bur oak came down 10 years ago. The group is on the South Fire Break. Unit 8 , with its venerable bur oaks, is on the right. 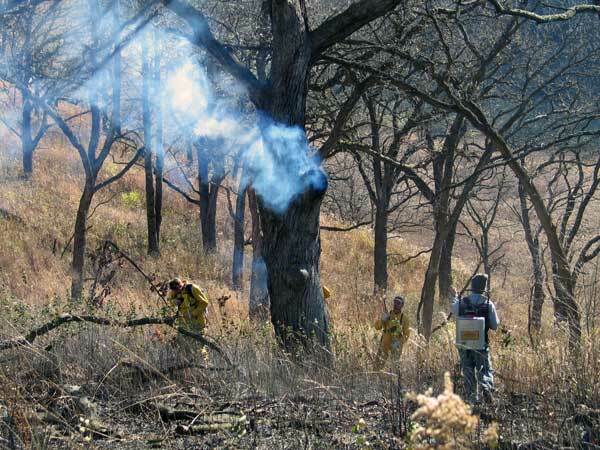 When we first started burning these savannas, we often did them on different days. However, good burn weather doesn’t come along every day. My philosophy has always been: “When the weather is right, and the crew is available, burn, burn, burn! The first time we did two burns at the same time was November 14, 2003. Because it was a fall burn, there were lots of people available (we had 15) and all were experienced. When we met at the cabin, I realized that we did not need so many people for a single burn, and suggested to the two most experienced people that we run two separate burns simultaneously. They agreed, and each chose his crew members. The wind was out of the south west, about 5-7 mph gusting to 11-12 mph. We liked the wind speed and direction, since it helped carry the fire up through the units. Getting the fire to carry well was often difficult in those early years of restoration, since the warm-season grass was just getting started, so we used head fires a lot. The temperature was 50 F and the R.H. in the upper 30s. We had everything set the day before: fire breaks, water jugs spotted near the burn units, drip torches full, etc. We took the whole crew and all the equipment to the top of the hill in trucks, dropping the Basin Savanna crew off on the way to the farther Ridge-top Savanna. The crew doing the Ridge-top Savanna burned Unit 19 first, thus establishing a solid black line at the downwind side of the unit. They had two drip torches, one went along the north side of Unit 19 and the other went along the service road. Once Unit 19 had been burned (about 1:30 PM), this crew used a head fire by lighting along the fire break at the south side of Units 8 and 10. The SW wind carried the fire up through the units, getting an almost 100% coverage. This was the best these two units had burned. In past years we had needed a lot of interior lighting to get good coverage of these units, but not this year. Simultaneously, the Basin Savanna crew started at the top (NE) corner of Unit 12A, near the steep ravine. One drip torch went west. The main problem here was because of the SW wind, they had to ensure that Toby’s Prairie did not ignite. 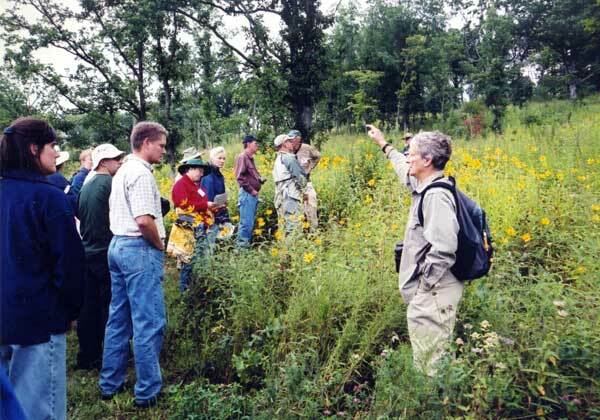 Spotters were placed inside Toby’s Prairie, but fortunately spotting was not a problem. Once the drip torch reached the west end of Unit 12A there was less problem. This drip torch continued lighting the savanna south of the service road (shown in red on the map), backburning Units 12B and 11B. It was 1:30 PM when the drip torch reached the top of the hill where the unit 19 burn had begun. This drip torch continued west along the service road to the side road, lighting Unit 11A. 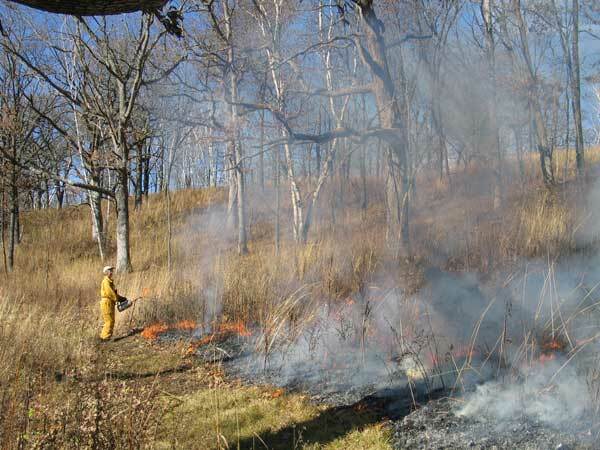 The other drip torch of the Basin Savanna burn went south down the edge of the steep ravine. 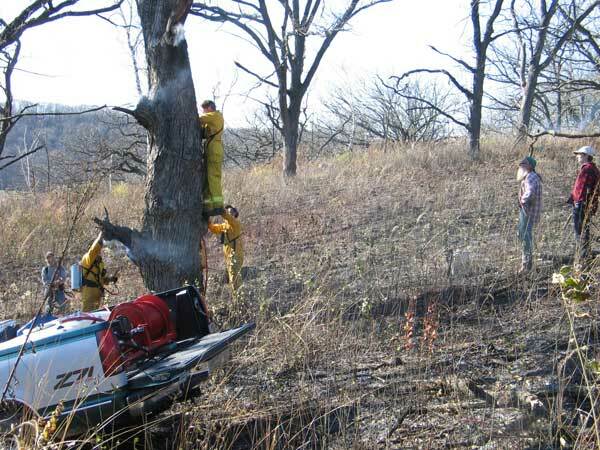 Although there was little fuel in the ravine, this line made sure fire did not burn down into the ravine. 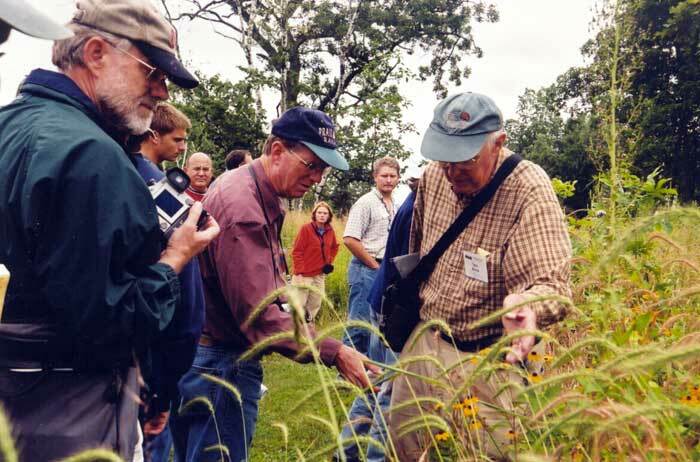 Once this line reached the bottom of the ravine (adjacent to the Pocket Prairie) the drip torch moved along the south edge of Unit 12A, 11D, and 18. 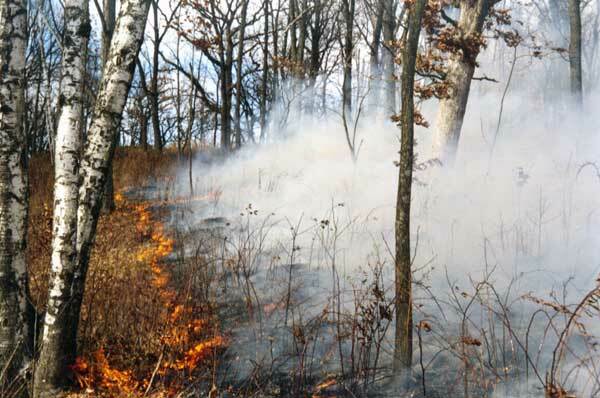 The southerly wind carried the fire uphill, so there was little problem with the Pocket Prairie burning. By the time the bottom crew reached Pleasant Valley Road the Ridge-top crew was finished and one of its drip torches and two waters burned the line separating Units 7 and 18. Two drip torches were used for interior lighting in Unit 11, starting below the crest of the hill. There was a good leaf pack at the west end of Unit 12 and the east end of Unit 11, and these areas burned very well. The lower part of these units had less leaf pack (fewer trees) and did not burn as well so extensive interior lighting was done. We finished interior lighting at 3 PM, at which time the wind had mostly died down and a bit of rain started to fall. Great timing! There was very little mop-up. We had cleared around snags and some special trees the day before. One large snag burned and fell, but well inside the burn unit. 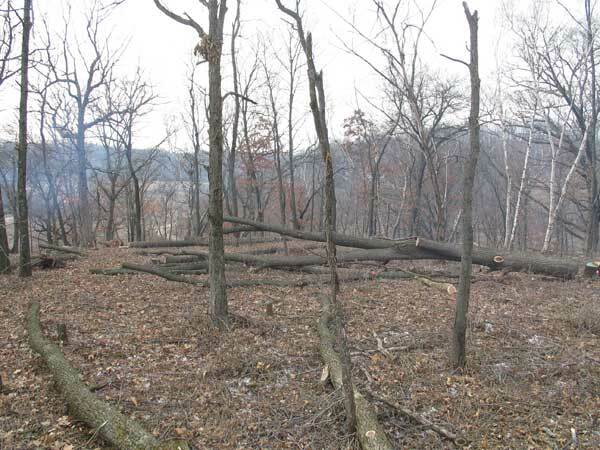 Also, there were a few piles of cut logs or brush piles scattered here and there. Most of these burned, a few for quite a while, but since none of these were near the edges, we let them burn out (our standard practice). 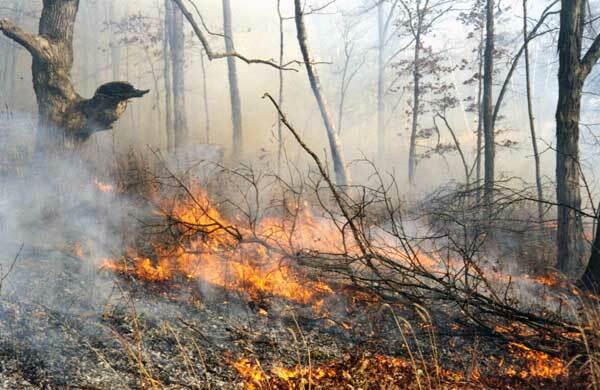 There are several advantages to this two-burn approach. All crew members were used extensively. Once there was a black line around the perimeter, novices could be used for interior lighting. And with changeable weather, more fire on-the-ground can be obtained before conditions worsen.